Every now and then you come across a new recipe that has you thinking “This is so simple and tastes so amazing. Where has it been all of my life?” These juicy burgers definitely fit into that category. In fact, just before I sat down to write this I had to get some more pork out to thaw because there is no way I am sharing this recipe with you today, and talking about it, and emailing about it, and NOT getting to have it! The trick is in that one surprise ingredient that I did not see coming – but it makes all the difference in the world. I tried this recipe for the first time in my first HelloFresh delivery and instantly fell in love. My husband and kids were fans from the first bite as well. I adapted it just a wee bit (leaving out the fresh rosemary because I’m just not someone who has fresh rosemary hanging around) and the flavor is still every bit as amazing. It’s truly hard to believe how simple this is. Another thing that amazed me is that if you make extra patties, they reheat well in the microwave. Usually, hamburger steaks toughen up a bit but these heat up as if they just came out of the skillet. Seriously. PLEASE, I implore you to try these as soon as you possibly can. Let me show you how easy they are to make! 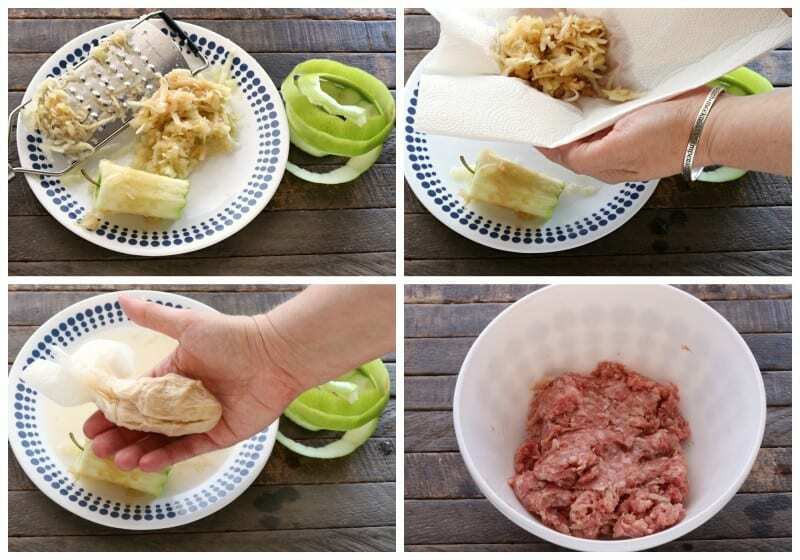 You’ll need ground pork ground beef and a medium to large Granny Smith apple, salt, and pepper. That’s it. But the trick is in what you do with that apple. Peel your apple and grate the entire thing (well, not the core of course) on a cheese grater or microplane. Place grated apple in center of paper towel. Hold paper towel over plate or bowl and squeeze tightly to remove most of the juice. Mix, by hand, grated apple, salt, and pepper into ground beef until well mixed. 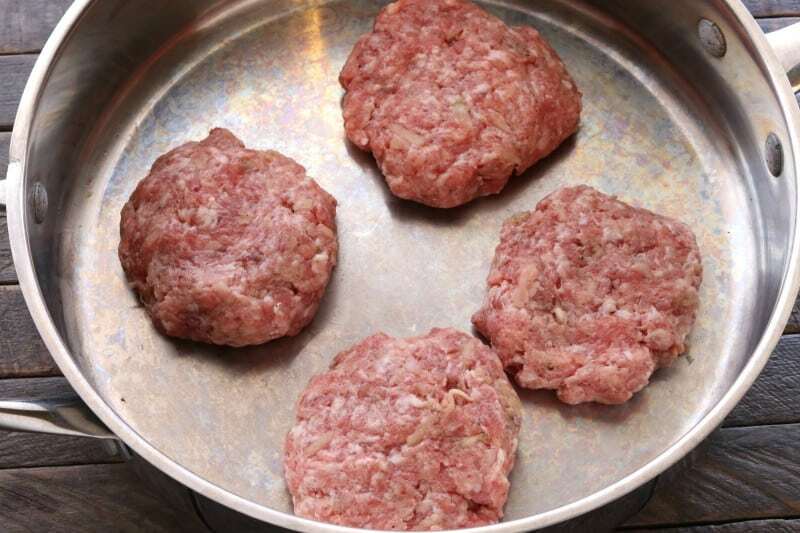 Form this into four patties and pan fry over medium heat until juices run clear. Try not to flip your patties until the meat releases, four to five minutes (or so, depending on your heat level). If you try to flip the meat and it sticks it has not released yet. Protein shrinks up as it cooks so this is what causes it to release from the skillet and allows for easy flipping. Enjoy your deliciously tender juicy burgers! Peel and grate apple. Wrap grated apple in center of paper towel and squeeze to remove much of the juice. In a medium bowl, place ground pork, grated apple, salt, and pepper. Mix with hands until well combined. Form into four patties. Pan fry over medium high heat until no longer pink in the center, flipping once. Enjoy! “No such thing as spare time. No such thing as free time. No such thing as down time. All you got it life time. Go. Do you taste the apple or is it a hidden taste? A friend of mine makes these with a 1/4 cup of applesauce and a 1/2 tsp. of garlic powder, and they are amazingly moist and oh, so good too. Cathy, I tried the applesauce and garlic pwr this weekend and they were so moist. I did them on the grill and that worked very good. In a couple weeks I will try them with a grated Granny Smith. I used Jimmy Dean sausage and if I’m out I use Tennessee Pride sausage. I’m with Christy with the ketchup condiment. The potatoes on your plate look delicious, what type are they and are they oven baked? 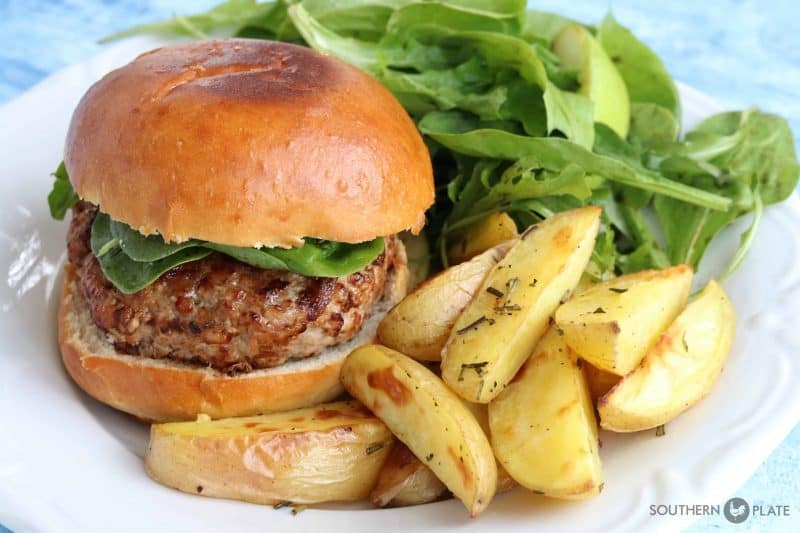 Want to try the pork burgers but would like the potatoes also. Enjoy all your post, keep up the good work! Me, too…how did you make those spuds? Can these be cooked on the grill? You mentioned using a skillet or pan. great tip about letting the meat release, thanks for explaining that! These look incredible! Did you top them with anything besides lettuce? My husband likes mayo and I’m the really weird one, I sneak a little ketchup. But for lunch today I just had the patty by itself. It has so much flavor and is so juicy I didn’t need anything else. I love Rosemary – if it were added, do you know how much to add? This looks very good – thanks for your great recipes. some burgers, bacon, etc. Would you mind sharing the brand, specifics, etc? about it – especially the singers (Rob Mills & Family) Don’t know if you’ve heard of them, but they do great southern gospel and are funny, too. Anyway, the apple dapple was wonderful. Thanks for any info. about the skillet. That is from a set of Wolfgang Puck pots and pans that I got on my thirtieth birthday – well over a decade ago. They have held up like an absolute dream. The set came from Sam’s Club and was about $100. I have had companies send me high end cookware and this ranks right up there with pots and pans ten times the price. Have you ever substituted another variety of apple? I don’t always have a Granny Smith available to me, but usually have some apples in the root cellar. This sounds wonderful – looking forward to trying it. There is something about apples and pork that just enhance each other. Love your posts and your positive attitude. You help keep me focused on what is important in life and remembering to value it. Thanks! I haven’t Dawn, it would work with any apple, just would change the taste slightly I think. Let me know if you give it a try. 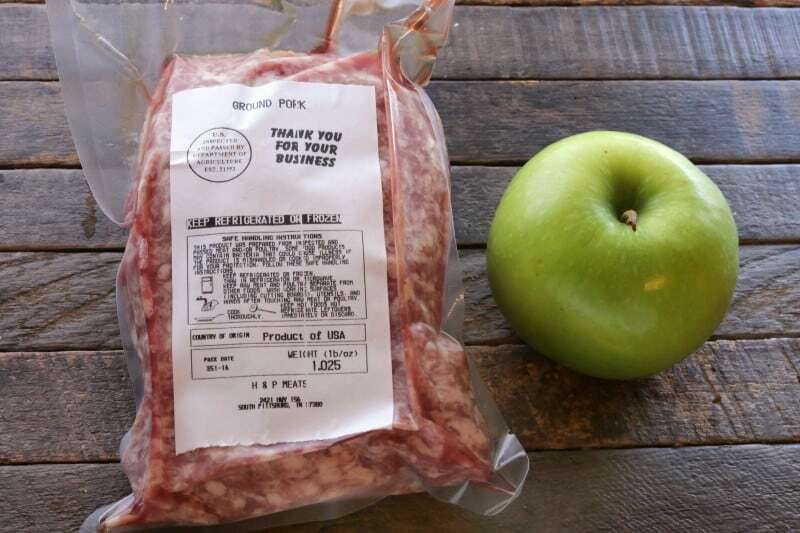 I’m going to try the “apple trick” in our venison. And pork ! Pork and venison together..Hmmm. What do you think of that meat combo ?? I used a potato masher to combine the pork and apple. Worked well. Frying them up now. Thanks for the recipe! I had one as a sandwich, with cheese and pickle yesterday, and it was good. Today, I just put the patty on my plate and put warm orange sauce over it with Bok Choy and bread on the side, and that was really good. There is a surprising amount of juice in an apple, and DON’T throw it away-it’s great to drink. It’s also nice to know that it works with turkey and chicken, and applesauce as I generally have the little plastic cups of unsweetened apple sauce on hand. I’m thinking you could add it to meatballs as well. I wonder if it would work for the Extra Lean ground beef as well? The pork patties are very good. I couldn’t taste the apple. I drank the apple juice and then chopped up the peel and core and added them to my salad greens. Didn’t waste a thing! I followed your recipe for the first 2 burgers then added the chopped dried rosemary in the last 2. I had fresh rosemary in a flowerpot but Sheba the kitten decided it needed re-potted then eaten. They were both excellent. Mixed them by hand cause I love the way pork fat makes my skin silky smooth after it is wiped off with a paper towel. LOL, hated to wash it off. This , like all of your recipes, is a keeper. TY for sharing. I am so glad you liked it Barbara!! Love that there was no waste!! I made these for dinner. I had no idea what they would taste like as I have never….no NEVER…bought ground pork before! Don’t ask me why…just never ran across a recipe that called for it. Anyway…I followed your recipe exactly. (I drank the apple juice too, Barbara. Delicious! ) I made the burgers just like I would beef hamburgers. Toasted buns, mayo, lettuce, tomato and onion…absolutely delicious. My husband loved them too. Thanks so much for another wonderful recipe. We will enjoy this again soon. I am so glad you liked them!!!!! These burgers look very, very interesting!! I bought the ingredients today and I’m going to make them for tomorrow’s 4th of July supper!! Here’s to hoping you’re right Mrs. Jordan, not that I’ve ever had a bad recipe I received from your blog! I hope you enjoyed the burgers and had a Happy 4th of July Thomas!!! I did, they were wonderful and even my picky 8 year old loved them!! 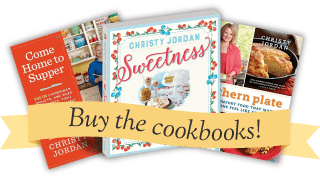 I love your recipes and blog!! Thank you so much for letting me know Thomas, so glad to hear they were a hit!! !